Upgrading the firmware using the Trivial File Transfer Protocol (TFTP) utility is done if you cannot access the web-based setup page to do the upgrade. This may be used as a fix to non-working (bricked) routers but this solution may not work for all. IMPORTANT: Before you start the upgrade, ensure that the preliminary steps below have been performed. Check LED lights – To check if your router can still work. Blinking red signifies that your router can no longer be fixed. For more information, click here. One-minute reset or Hard Reset – While the router is plugged in, continuously press the reset button for one (1) minute, observe the behavior of the LED lights while performing this step to check the router’s response. NOTE: This step will erase all of your router’s settings and restore it to the factory default. Powercycle the router – To perform a powercycle, unplug the device from the power source for about 30 seconds before plugging it back. Set Static IP on the computer – In order to ping the router, we have to set a Static IP for the router. For more information, click here. Ping the router – this is to ensure that you can establish a connection with your router. For more information on how to do this, click here. NOTE: It is strongly recommended to use a computer that is hardwired to the router when doing the upgrade to avoid interference during the process. i. TFTP Utility - To download the TFTP utility, click here. ii. 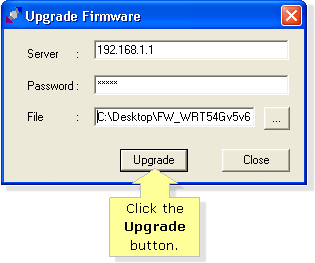 Firmware – Click here for instructions on how to download the firmware of the router. Double-click the TFTP utility icon. Enter the IP Address and password of your router in the Server and Password fields. NOTE: The router’s default IP Address is 192.168.1.1 and the default password is admin. 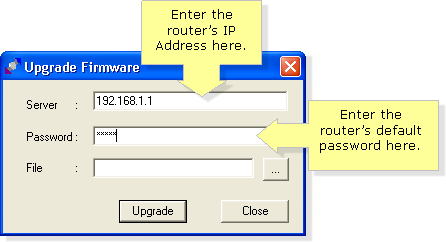 If you have different IP Address and router password, you need to use those information instead. Click the Browse button and open the firmware file you downloaded earlier. NOTE: If you encounter errors or problems, reset the router or perform a powercycle. To perform a powercycle, unplug the device from the power source for about 30 seconds before plugging it back. After that, repeat the upgrade process. Once you have successfully upgraded the router’s firmware, you should now be able to log in to the router’s web-based setup page. IMPORTANT: If you were still unable to upgrade the router after doing all the steps above, you may visit the Linksys Support Site to for additional information and assistance.